In the wake of the Zika virus epidemic, which has been linked to the birth defect microcephaly, abortion rights activists in Brazil are petitioning their Supreme Court to allow women affected with the Zika virus to get abortions. These children are said to have no futures, and abortion is being presented as the merciful choice. Microcephaly is a box of surprises. You may suffer from serious problems or you may not. So I believe that those who have abortions are not giving their children a chance to succeed. I survived, as do many others with microcephaly. Our mothers did not abort. That is why we exist. Unfortunately, this ableist strategy is not new when it comes to pro-choice activism. The thalidomide crisis was exploited by the pro-choice movement in the 1960s in their campaign to liberalize abortion laws. Just like with the Zika virus, children damaged by thalidomide were described as grotesque deformities, monsters with no quality of life. Today, thalidomide survivors are speaking out. While the birth defects have caused them suffering, many also report a good quality of life and thankfulness for their survival. 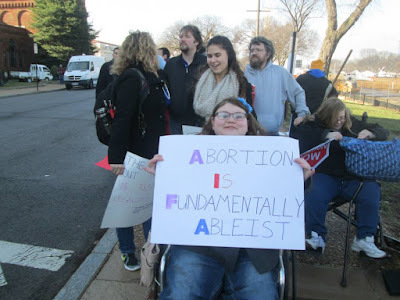 This most recent ableist campaign reveals what abortion is really driven by: fear of an uncertain future, and a belief that certain people, particularly the poor and the disabled, are better off dead. The unborn are disproportionately likely to be victims of such beliefs, since they are not being seen as being persons with a right to life. After all, for the most part, we don’t think that it should be legal for parents to decide to euthanize even a terminally ill born child, because we understand that they are persons, with a right to life, even though their lifespan is short. Yet when it comes to the unborn, we allow their parents to sentence them to death for the most trivial reasons, because we buy into a bigoted and fundamentally ableist ideology that assigns personhood based not on who we are, but on what we are currently able to do and how developed we are.